Everyone knows that their fingers get all wrinkled after spending too much time in the tub or swimming, but apparently nobody was really certain as to why—until now. According to a new study, it has to do with evolution and the way our ancestors lived. 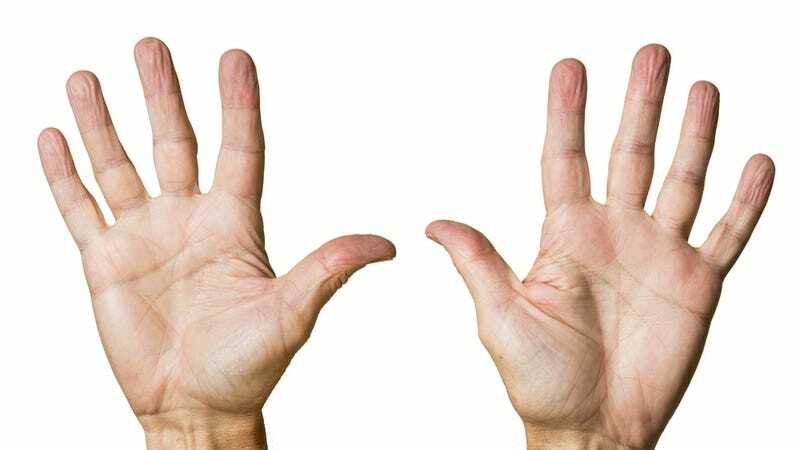 Previously, it was believed that pruney fingers had to do with water absorption. But other more recent research has shown that wrinkles form as a result of vasoconstriction (when blood vessels constrict beneath the skin). Because this is an active process and not merely a byproduct of water absorption, researchers began looking for reasons why our bodies would do that. For the study—conducted at Newcastle University in the UK and published this week in the journal Biology Letters—test subjects were asked to move wet glass marbles from one container to the next, first with dry hands and then with pruned hands that were soaked in warm water for 30 minutes. They were able to move the wet marbles 12 percent more quickly with the pruney fingers. "Going back in time, this wrinkling of our fingers in wet conditions could have helped with gathering food from wet vegetation or streams," study coauthor and behavioral researcher Tom Smulders said in a press statement. "And as we see the effect in our toes too, this may have been an advantage as it may have meant our ancestors were able to get a better footing in the rain." Now, of course, the our pruney fingers help us to not drop our iPads in the tub.